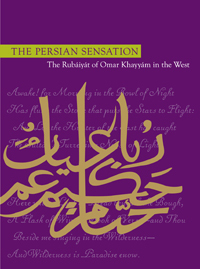 The Harry Ransom Center’s exhibition The Persian Sensation: The Rubáiyát of Omar Khayyám in the West has recently garnered coverage in multiple Arabic and Persian news outlets. The exhibition has been mentioned in the Tehran Times, Payvand’s Iran News, MehrNews.com, Persian Journal, Press TV and Aaram News. The U.S. Department of State has also published information about the exhibition on its website in English, Persian and Arabic. The Persian Sensation is on display at the Ransom Center through Aug. 2. The year 2009 marks the 150th anniversary of Edward FitzGerald’s landmark translation of the poetry of the medieval Persian astronomer Omar Khayyám. These gemlike verses about mortality, fate, and doubt became an unprecedented popular phenomenon in England and America but have since fallen into obscurity. Featuring 200 items from the Ransom Center’s extensive collections, the exhibition narrates The Rubáiyát’s history through such items as Persian manuscripts, miniature editions, and illustrated parodies. This entry was posted in In the News and tagged Aaram News, Harry Ransom Center, MehrNews.com, Payvand’s Iran News, Press TV, Tehran Times, the Persian Journal, The Persian Sensation: The Rubáiyát of Omar Khayyám in, The University of Texas at Austin, U.S. Department of State by Alicia Dietrich. Bookmark the permalink.